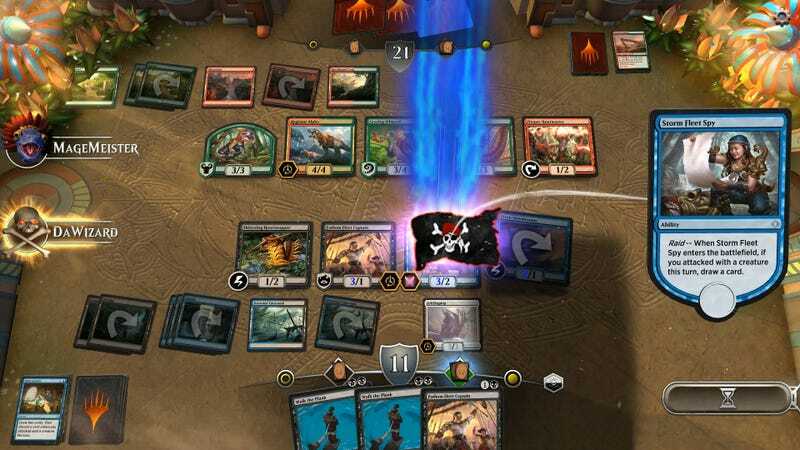 Revealed yesterday via live stream, Magic: The Gathering Arena is a new way to play Wizards of the Coast’s trading card game online. Built with streaming and spectating in mind, it’s much prettier than tired old Magic Online, which it’s totally not replacing. Magic Online is an excellent way to play Magic online, but it’s very basic and not very pretty. Certainly not as pretty as Hearthstone. With its stylized game boards, cool animations and special effects, Blizzard’s trading card game proved that the genre can be more than simply flipping over cards. With Magic: The Gathering Arena, Wizards of the Coast is getting in on some of that action. It’s the first game from the company’s new digital games studio, built to be eye-catching and entertaining not just for players, but for spectators as well. They want players to stream Magic and people to watch them do it. And so we’ve got only the art and stats from cards shown on the playfield. Certain cards feature flashy animations as they come into play. Cards with effects like trample or flying will kick up dust clouds or hover. You can see all of this in action in the archived live stream vid below. Magic Online isn’t going away. It’ll be supported with new cards just as it’s always been. Magic: The Gathering Arena will primarily focus on newer game settings, keeping the action fresh and exciting for streamers and viewers. To an extent it is Magic Online with a lot less cards, but it’s got style. Points for style. Players interested in giving the new game a go can sign up for closed beta at PlayMTGArena.com. Wizards stressed the importance of player input in developing the game further, so if you want to make sure they don’t screw it up somehow, get in there and be heard.